NicoDerm CQ Review and Results - Does NicoDerm CQ Work? 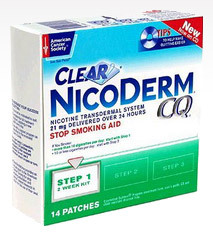 The NicoDerm CQ program is a nicotine patch for use as a stop smoking aid. The transdermal patch contains a rate-controlling membrane, which releases nicotine into the bloodstream via the skin at a carefully controlled rate. The amount of nicotine from NicoDerm CQ is less than the nicotine provided by a cigarette, but it is sufficient to help stop cigarette cravings cause by nicotine addiction and to diminish the symptoms of nicotine withdrawal, which include irritability, headaches, sore throat, digestive upsets, insomnia, and fatigue. The NicoDerm CQ program consists of a series of patches which contain progressively smaller doses of nicotine to slowly wean your body from highly addictive nicotine, a substance which some studies have shown is even more addictive than cocaine or heroin. NicoDerm CQ patches come with an individualized stop smoking program, called "CQ" for Committed Quitters. It's basically a tailored smoking cessation plan with instructions, support, and tips for realizing the most success with stopping smoking. Glaxo SmithKline, the manufacturers of NicoDerm CQ, has found that the Committed Quitters program has improved the success rate of those trying to stop smoking by 28 percent over only using the patches alone. The NicoDerm CQ patch is available in three strengths: 21 mg, 14 mg, and 7 mg, and in two program variations, ten weeks and eight weeks. For smokers who use over ten cigarettes per day, the program recommends starting with the 21 mg patch for weeks one through six, switching to the 14 mg patch for weeks seven and eight, and finishing up with the 7 mg patch for the final two weeks. In the case of those who smoke ten or fewer cigarettes daily, the recommendation is to use the 14 mg patch for the first six weeks and the 7 mg patch for weeks seven and eight. Patches are applied to clean, dry skin and left in place for 16 to 24 hours before being replaced. New patches should be applied to a different skin site than the old patch. The active ingredient in NicoDerm CQ is nicotine. Inactive ingredients include ethylene/vinyl acetate copolymer, high density polyethylene, polyisobutylene, and clear polyester backings. The NicoDerm CQ product is available from a wide range of national chain stores, including Walmart, CVS, Rite Aid, and Target. Many online retailers also sell NicoDerm CQ. Prices vary by retailer; a typical price for a 14-patch box is the $40.99 charged by Target. As different retailers sometimes offer promotions for NicoDerm CQ, it can pay to shop around; remember to factor in the shipping and handling charges when comparing prices from online merchants. At $40 to $50 per week for eight to ten weeks, NicoDerm CQ can be expensive. To reduce the price by a bit, the manufacturer offers a $7 coupon, along with a free sample of NicoDerm CQ. NicoDerm CQ has been on the market for several years, so it has generated quite a few testimonials. Many users were able to stop smoking using the product, while others either did not tolerate the patch well or stopped smoking temporarily but went back to smoking afterward. The positive feedback about NicoDerm CQ is that is helped smokers to manage their cravings for cigarettes and it lessened the irritability and other symptoms they had felt previously when trying to quit. The downsides mentioned in testimonials are the expense of the product and the problems with itchy rashes at the site where the patch is applied. Especially for users with sensitive skin, NicoDerm CQ caused an extremely itchy rash that lasted for days and occasionally weeks. The NicoDerm CQ patches contain nicotine, which is the very substance that makes smoking so hard to quit. Although the nicotine is in somewhat lower concentrations than received through conventional cigarettes, it is still a dangerous substance with many adverse effects on the body. Nicotine has been associated with a range of conditions and diseases, including cancer, fatigue, a weakened immune system, and increased blood pressure. We recommend a stop-smoking aid without nicotine; there are highly effective products which can help to curb cravings and manage the other symptoms of nicotine withdrawal through all-natural ingredients, rather than nicotine in lower doses.